I'll freely admit that I'm as sentimental as most mothers, and that like a lot of us, I squirreled away my children's first lost baby teeth as mementos. They're tucked in my desk, inelegantly sealed in business envelopes, preserved for...something. But then, I'm not Queen Victoria (1819-1901). When Victoria's oldest child, the Princess Victoria, Princess Royal (1840-1901), shed her first baby tooth, it, too, was preserved, though not in a lowly envelope. The seven-year-old princess's father, Prince Albert (1819- 1861) tugged the tooth free himself in 1847, while the royal family was visiting Ardverikie, by Loch Laggan, as a guest of the Duke of Abercorn. As a memento of both the enjoyable visit (Victoria was so smitten with Scotland that she soon purchased Balmoral Castle as her own retreat in the Highlands) and to commemorate the landmark event in Princess Vicky's young life, Albert had the tooth made into a special brooch, left, for Victoria. Set in gold, the tooth forms the blossom of a gold and enamel thistle, the symbolic wildflower of Scotland. A "private" piece of jewelry as opposed to royal jewels for state occasions, the small brooch had never been shared with the public until last fall, when it was included in the Victoria & Albert: Art & Love exhibition at Buckingham Palace. It's easy to dismiss a brooch featuring a baby's tooth as one more example of slightly macabre 19th c. taste, but in some circles, such mother's jewelry is still made and worn. Check out actress Susan Sarandon's custom-made bracelet, featuring her children's assorted baby teeth as the charms. 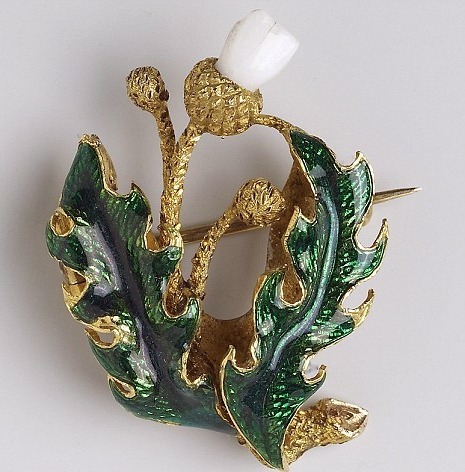 Above: Brooch, gold, enamel, & tooth, 1847. Commissioned by Prince Albert for Queen Victoria. Photo copyright The Royal Collection. Well, as a lover of all things Victorian whether teeth or hair related, what an amazing piece to have. A true example of what unlimited money can bring either English Royal or American "royal", aka hollywood can obtain. Although I would take the class of English royal over hollywood anyday. I am truely amazed at the topics and pictures that you share with your blogging friends. I just love it. Thanks. Writing from Australia here. I used my son's baby teeth in a necklace I made for my final year of Gold and SIlversmithing. Along with High Distinctions, the necklace, also containing other mementos, went on display at a local Art Show. To my surprise, an artist bought the piece, despite its deliberately high price. I was saddened at first but later, when I learned it was worn to a Royal occasion at the Savoy Hotel London, I felt the sacrifice was worth it. Thanks girls, keep up your fabulously interesting blogs. I think it's wonderfully sweet and romantic that they did that. I'm sure though that none of Bertie's teeth got such a royal treatment! I love gestures like this. Albert was a man who clearly *got* it. I think that this is an especially lovely remembrance. Certainly unique! A quick bit of googling turned up directions for making your own baby teeth jewelry, plus web sites that will do it for you. Clearly Prince Albert was ahead of his time.